The Imhoff tank is a relatively simple anaerobic system that was used to treat wastewater before heated digesters were developed. It is still used for plants of small capacity. 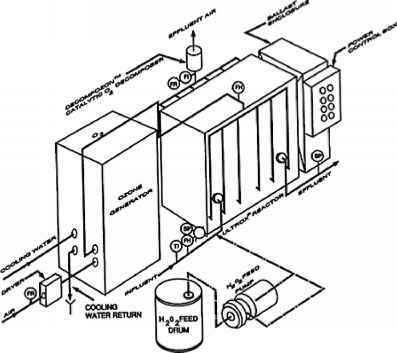 The system consists of a two-chamber rectangular tank, usually built partially underground (Fig. 16). Figure 16 An Imhoff tank. be prevented by using a baffle at the entrance with more than one port for discharge. The lower compartment is generally unheated. 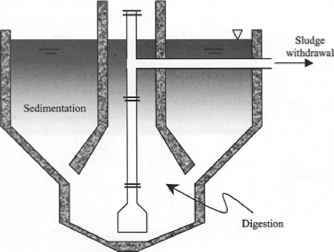 The stabilized sludge is removed from the bottom, generally twice a year, to provide ample time for the sludge to stabilize, although the removal frequency is sometimes dictated by the convenience of sludge disposal. In some cases, these tanks are designed with inlets and outlets at both ends, and the wastewater flow is reversed periodically so that the sludge at the bottom accumulates evenly. Although they are simple installations, Imhoff tanks are not without inconveniences; foaming, odor, and scum can form. These typically result when the temperature falls below 15°C and causes a process imbalance in which the bacteria that produce volatile acids predominate and methane production is reduced. This is why in some cases immersed heaters are used during cold weather. Scum forms because the gases that originate during anaerobic digestion are entrapped by the solids, causing the latter to float. This is usually overcome by increasing the depth in the lower chamber. At lower depths, bubbles form at a higher pressure, expand more when rising, and are more likely to escape from the solids. Odor problem is minimal when the two stages of the process of acid formation and gas formation are balanced. Coagulation or flocculation tanks are used to improve the treatability of wastewater and to remove grease and scum from wastewater . In coagulation operations, a chemical substance is added to an organic colloidal suspension to destabilize it by reducing forces that keep them apart, that is, to reduce the surface charges responsible for particle repulsions. This reduction in charges is essential for flocculation, which has the purpose of clustering fine matter to facilitate its removal. Particles of larger size are then settled and clarified effluent is obtained. Fig. 17 illustrates the coagulation/flocculation and settling of a seafood-processing wastewater. In seafood processing wastewaters, the colloids present are of an organic nature and are stabilized by layers of ions that result in particles with the same surface charge, thereby increasing their mutual repulsion and stabilization of the colloidal suspension. This kind of wastewater may contain appreciable amounts of proteins and microorganisms, which become charged due to the ionization of carboxyl and amino groups or their constituent amino acids. Figure 17 Chemical coagulation process. The oil and grease particles, normally neutral in charge, become charged due to preferential absorption of anions, which are mainly hydroxyl ions. Several steps are involved in the coagulation process. First, coagulant is added to the effluent, and mixing proceeds rapidly and with high intensity. The purpose is to obtain intimate mixing of the coagulant with the wastewater, thereby increasing the effectiveness of destabilization of particles and initiating coagulation. A second stage follows in which flocculation occurs for a period of up to 30 minutes. In the latter case, the suspension is stirred slowly to increase the possibility of contact between coagulating particles and to facilitate the development of large flocs. These flocs are then transferred to a clarification basin in which they settle and are removed from the bottom while the clarified effluent overflows. Several substances may be used as coagulants. The pH of several wastewaters of the proteinaceous nature can be adjusted by adding acid or alkali. The addition of acid is more common, resulting in coagulation of the proteins by denaturing them, changing their structural conformation due to the change in their surface charge distribution. Thermal denaturation of proteins can also be used, but due to its high energy demand, it is only advisable if excess steam is available. In fact, the "cooking" of the blood-water in fishmeal plants is basically a thermal coagulation process. Another commonly used coagulant is polyelectrolyte, which may be further categorized as cationic and anionic coagulants. Cationic polyelectrolytes act as a coagulant by lowering the charge of the wastewater particles because wastewater particles are negatively charged. Anionic or neutral polyelectrolyte are used as bridges between the already formed particles that interact during the flocculation process, resulting in an increase of floc size. Since the recovered sludges from coagulation/flocculation processes may sometimes be added to animal feeds, it is advisable to ensure that the coagulant or flocculant used is not toxic. In seafood-processing wastewaters there are several reports on the use (at both pilot plant and working scale) of inorganic coagulants such as aluminum sulfate, ferric chloride, ferric sulfate, or organic coagulants [22-25]. On the other hand, fish scales are reported to be used effectively as an organic wastewater coagulant . These are dried and ground before being added as coagulant in powder form. Another marine byproduct that can be used as coagulant is a natural polymer derived from chitin, a main constituent of the exoskeletons of crustaceans, which is also known as chitosan.